It's time to write about the Disc Hive. This is the hive that most of all makes me want to move house to somewhere with land. As soon as possible. The airspace is busy, isn't it? You know what, I'm not going to stand there and take that photo on a warm, sunny day when the bees get really active. Some days I even avoid using the back door at all. It's not that the bees are aggressive, but imagine if you had to walk across a motorway to hang out your washing. The roar whizzing past your ears is off-putting even if you don't get hit. This is a prolific colony which has erupted into spring, and what I saw on my "Spring Opening" told me that they'd probably be making plans to swarm as soon as possible. That guess was right on the mark. Last year, my colonies started swarming at the start of May. This year, the colony in the Disc Hive had its bags packed by Good Friday. So, enter the vertical split using one of my new Snelgrove boards. I practised first on the Copper Hive, a colony of known docile temper, located on solid ground with plenty of space to manoeuvre. As reported, that went well. Now we simply repeat the process...Ha ha ha. The colony in the Disc hive was a few steps ahead of me. When I opened the hive, I found a sealed queen cell and several unsealed ones. In other words, new queens were already on the way. Received wisdom is that the old queen leaves the hive with the swarm just as the first new queen cell is sealed. So had Queen Honey gone? Well, I couldn't find her but the hive was still jam-packed with bees so I don't think they had yet swarmed. And I hadn't seen a swarm leave. I think they were poised to go, and that they would have gone that very afternoon if I hadn't waded in and scuppered their carefully laid plans. In parallel with rearing the new queens, the bees would have spent the preceding days readying Queen Honey to swarm, reducing her food intake to slim her down in preparation for flight and reducing her egg-laying. Her smaller size would have made her even harder to find in that huge crowd of bees, so I'm not surprised I couldn't see her. I did, however, hear her. I think. There was a piping sound, and it's unlikely to have come from the new queen who is still sealed in the queen cell, because (I'm assuming) that queen cell must only just have been sealed and the queen within would still be pupating...she won't be ready to emerge or be able to pipe for about another week. There are many, many versions of the Snelgrove method of swarm control. Most of them start with finding the queen. Having been flummoxed in that, I decided to just do a version of the method anyway and try to work things out afterwards. So I divided the colony just as if I'd found the queen, putting a new lower box on the hive stand with only a single frame of brood in it, and putting the original box on top over a Snelgrove board. So what I think I ended up with is a hive in which Queen Honey is upstairs with the bulk of the brood and house bees and the developing queens, while the flying bees are downstairs, and everyone is wondering what happened. That was Saturday. 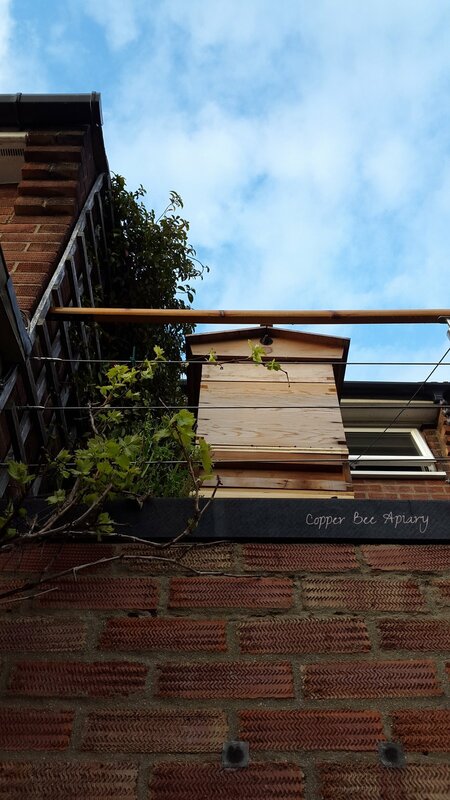 Today (Easter Monday), I opened the hive again, having spent the interim pondering the many different variables and come up with a plan. The plan being to transfer the sealed queen cell into the bottom brood box, to give those flying bees a queen and to avoid an ugly fight breaking out in the top brood box between the new queen and Queen Honey. If Queen Honey is there. And if the new queen in the queen cell is still alive. Anyway, today I carried out the plan. The sealed queen cell still looked intact and was being tended by the workers. I swapped the queen cell-bearing frame for the frame of brood in the bottom box, which by this time was covered in the beginnings of emergency queen cells (showing that there was no queen in the bottom box). If all is well and the new queen emerges from her cell next week, she'll be able to go on her mating flights in peace without some pesky person changing the hive doors round every few days, and if she mates successfully then she'll be able to settle down and start laying without disturbance. Meanwhile, we'll see what happens in the top box. I think Queen Honey is still there, but I'm hoping she won't swarm if I keep depleting the flying bee population through the door switching trick. "I'm having a rest from bees tomorrow. Pond Hive, please be good". Who knew the bees would read my blog and plan their escape for when I was away? I shall try to avoid such giveaways in future. You'll have to understand, readers, if I leave out a few key details from time to time. When I opened the hive today, I found several sealed queen cells (and more on the way, unsealed). There was a big brood nest including eggs, so Queen Felicity must have been there within the past 3 days (eggs hatch after 3 days). But unlike the Disc Hive, this hive was not chock-full of bees. So I reckon the swarm left yesterday. Well, having already formulated a plan for a similar scenario in the Disc Hive, I implemented that plan on the Pond Hive too. Single frame with queen cells below the Snelgrove Board, everyone else above. Flying bees should fill the bottom box, which should have a new laying queen in a few weeks if all goes to plan (ha!). Meanwhile I think the colony in the upper box is queenless, but it should continue to rear the existing brood and provide a metered supply of flying bees to the bottom box. So, bees, that's what to do. Please.